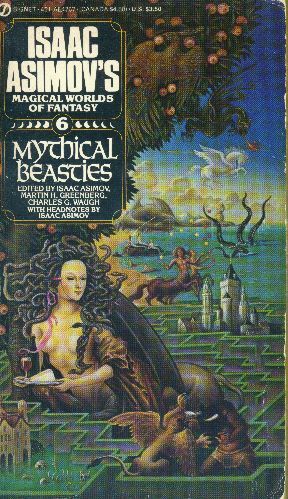 Nobody is more surprised than I that I actually enjoy this anthology, despite the fact that there’s nothing by the Good Doctor in it, and despite the fact that it’s in the “Isaac Asimov’s Magical Worlds of Fantasy” series. The fact is, however, that in all the stories here there are only one or two I don’t like very much (most notably the final story, “Mood Wendigo” by Thomas A. Easton), there are a number which are quite good (e.g., F.A. Javor’s “Triumph of Pegasus”) and several which are very good, notably Mildred Clingerman’s “Letters from Laura,” Frank R. Stockton’s “The Griffin and the Minor Canon,” and Andrew Lang’s “Prince Prigio.” To top it off, this actually contains Hans Christian Andersen’s “The Little Mermaid,” which is a beautiful, beautiful tale and infinitely better than the Disneyfied version (although that’s quite good, too). This is actually an anthology which is worth the effort to own, in other words, which, as I say, is more than a slight surprise.